Eastern Virtual Airlines - NOW OPEN! Welcome to Eastern Virtual Airlines! 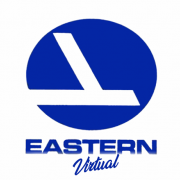 You may be wondering, What is Eastern Virtual Airlines? 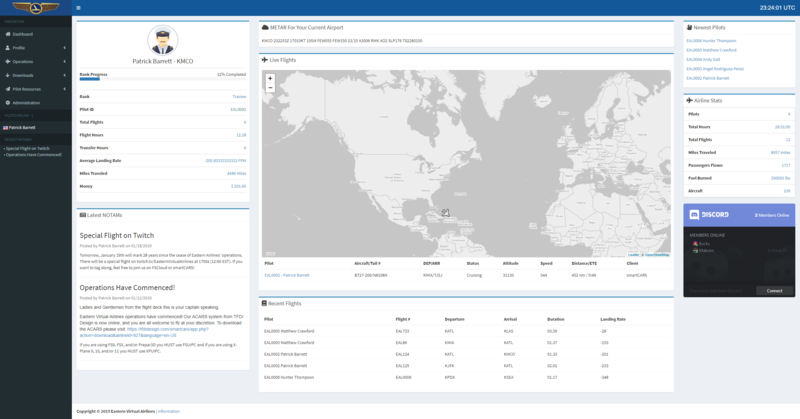 • Heavily customized CrewCenter dashboard. • Constantly updating our webpage. • Charter system - Fly from/to any airport you wish (Within our list of airport operations)! - Schedule system is in the works. • Real-Time ACARS - Thanks to our hosting software & smartCARS from TFDi Design, we're able to provide a real-time ACARS map running OpenStreetMap. • Unique FSEconomy Group - Operated under the name Eastern Express, we fly anything from your ordinary GA to the 'ole Douglas DC-3. We're always trying to expand our fleet on that platform. • We support the following Flight Simulator platforms: FS2004, FSX & FSX:SE, Prepar3D V3/V4, and X-Plane 9/10/11. • Interactive & Troll-Free Community! So now the money question is, where can I register? » https://easternvirtualairlines.com - More information on our airline can be found on the homepage, and to get started please click the "Register" button near the top of the page. We look forward to having you join our airline!